Doxie Mel Designs: Jaded Blossom Release Day! :: Chocolate, YES! Hello Everyone! Today is Jaded Blossom's Release Day! This morning we are previewing the stamp set "Periodic Words" and here is the card I created. The chocolate stamp goes perfectly with the Kawaii Candy Bar from SVG Cutting Files. 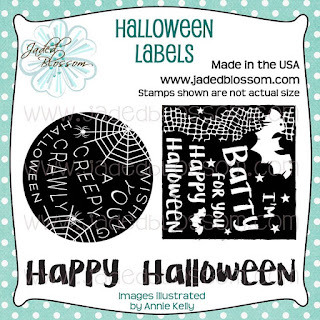 A background is created with the NEW Halloween Scenic Dies.. love all the stars! Be sure to come back at 4 pm today for the Jaded Blossom Blog Hop. Head on over to Jaded Blossom to see more projects created with the New Periodic Words. This is so cute! Yummy!